This is an area that gets runoff from the street where it dead-ends at our fence, so it's able to sustain some tallgrass species without extra watering. Before we got the 80 acres, we were already collecting native grass and forbs from construction sites where they were about to be destroyed, and replanting it here to propagate in hopes of someday having land for it. 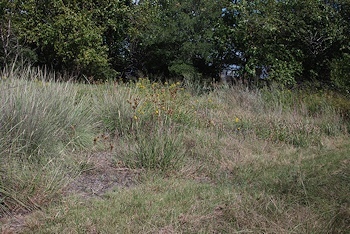 Visible in this picture are Lindheimer Muhley, Eastern gama, Indiangrass, and Switchgrass, plus Maximilian sunflower and Goldenrod, as well as the dead stalks of Eryngo that flowered a month ago. In wet years with a good spring forecast, we dig up root divisions and move them onto the 80 acres--some have done well (including Big Bluestem) but the thriving Switchgrass and Eastern Gama that was doing well on the seasonal creek bed died with the drought when the creek was bone dry all year long two years in a row. 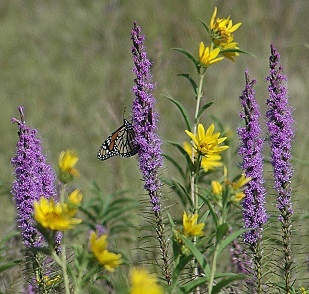 This image of Gayfeather (magenta) and Maximilian sunflower with monarch butterfly is from another year, when the monarch migration coincided with the peak of Gayfeather and Maximilian flowering. This year they're out of synch--climate change affects their migration time as well as when these flowers bloom (and how much, as heat and lack of rainfall stunts or delays flowering. But these colors are present in and around the grass garden. 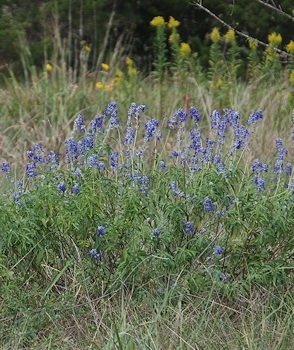 Also in bloom right now is Mealy Blue Sage, a forb that blooms when there's enough rainfall. We had a good solid rain a couple of weeks ago, so we have a good display of heavenly blue from this clump in what was the little orchard (the fruit trees all died in the drought.) 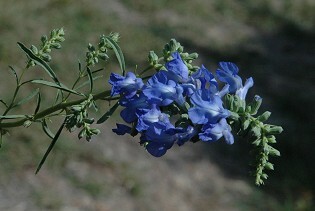 Mealy Blue Sage grows on thinner drier soil (thus not in the grass garden) and among shorter grasses. Both Goldenrod (taller) and Maximilian Sunflower are the yellow spots behind the sage. Another blue fall-flowering sage (this one flowers only in fall) is Pitcher Sage, one of the old tallgrass prairie survivors. I don't have any pictures of this year, but here's a picture from a previous year. Pitcher sage grows long and tall, to stay with the tallgrasses it used to have around it. In this shot it's leaning sideways, because its very long stalk isn't supported by surrounding tallgrasses. The warm-weather grasses are blooming now, both the short ones, like Buffalograss, and the tall ones: Big Bluestem, Indiangrass, Switchgrass, Lindheimer Muhley, Eastern Gama. Oh, and some of the midgrasses: Little Bluestem and Sideoats Grama. But on a windy day it's nearly impossible to get pictures of that. After one of those paradoxical hottest days right before a cold front, tomorrow it is not forecast to get above the sixties in north Texas—I'm going to have to go digging for my sweats! Hope the front moves on as far as you, and you can stand to wear those protective layers. …The front is here, but none of the promised rain yet. Mid-70s here. If it doesn't rain I'll be outside doing stuff. With long sleeves on. I do think it's fun when you get a really hot muggy day and the front comes in afternoon, so you can stand outside and experience the exact arrival--the feeling of the layer of cool air sneaking ahead of the front, chilling your toes and ankles--and then moving up your legs (helps to wear shorts) and finally in your face, and it's wonderful, and the sweat's drying...and suddenly there's a stronger gust of below-AC-temp air and you get goosebumps, and love them because FINALLY, and you stand there as long as you can before running for the south side of the house because the temp is falling so fast. I love holding a thermometer and watching the mercury drop. Sympathies re heat. I dislike sunscreen, so I have some long-sleeved bright white shirts with high spf that I wear over tank tops in hot weather. Good sun protection, no sun screen and almost as cool as just the tank top alone. I don't like the greasy feel or the smell of sunscreen, though this year I used it most of the time I was out in midday. (Clearly, not enough...) I wish they'd make sunscreen in a wintry scent--pine, spruce, juniper, something clean and green smelling. But nobody asked me...) I need to find shirts like yours. I feel the same way re the greasy feel of sunscreen. I look for tightly woven men's shirts. I've also bought some really nice ones from Tilley (http://www.tilley.com/canada_en/), who make wonderful travel clothing that wears very well. My last shirt was from Lands End (mens small, fits quite well as I have relatively long arms and a very long body). I don't know if you can get Rohan clothing over in the US, but their shirts are mostly SPF 40+. I have more of the short-sleeved ones, but I do have a couple of long-sleeved ones too. They tend to be pricey, unfortunately, but they do last for ages! I am seriously impressed by your project to protect and replant local grasses. One of the least talked about but most serious environmental threats is the shrinking of plant diversity. I'm doing a photo walk today in El Paso (otherwise I'd never be up at this ghodforsaken hour ), whenever I'm spending a day in the sun and it's planned in advance, I wear a special Eddie Bauer long sleeve shirt that has an SPF of 45 or so. And a hat. It's more an 'I burn easily' than a cancer paranoia issue. I hope the treatment continues to go well. Thank you for the photos - it's always lovely seeing other people's wildflowers! And wildlife, come to that - one of my big regrets is that I've never been in the USA at a time of year when I can expect to see hummingbirds. Also be careful of reflected sun off of pavements, Mu first time with the creme I got fried while wearing a huge brimmed hat, just walking across the supermarket parking lot - my neck and the underside of my chin! We just purchased a combined 80 acres of forest in southern Oklahoma. It's completely surrounded by miles of winter wheat crops for cattle. I think it mostly survived due to having a major creek run through it. A drought has to be extremely bad for the creek to run dry. We do have to cut out some trees for building, but the guy doing the dozing knows which trees are good and which ones are not. The ones that I call scrub oak, dad calls post oak, and the dozer guy called blackjacks are the only ones he's clearing. The natives are all staying. We'll also replace some of them with nicer trees (in some cases, living trees). I need to learn a lot more, from understanding what trees are there, to understanding what the wildlife population counts are and ensuring they have what they need. but but but … post oak and blackjack ARE natives - most of my good trees here north of Dallas are those two species. I sure envy you your permanent water. Hope you have a wonderful time with your new land-steward adventure! lol, yeah. I figured they were native. Very common in north Texas and southern Oklahoma. However, they tend to die easily, don't provide much in leaf cover, and the limbs have a tendency to fall off. I think we'll nurture some of the more manageable trees. There will be plenty of post oaks and blackjacks on the land. Some areas we are leaving completely untouched. We know the deer bed down there, and the last thing we want to do is ask the deer to move away. Added to list of things to learn.... How to butcher (not just field dress) my own deer, wild hog, and cow. Turns out, that cattle must be able to walk into the butchery. Any cows that have a mishap, our neighbors will let us butcher ourselves. Of course, it doesn't happen too often, but even a single cow a year is more than enough to feed my family. I also tend to like beef. WHOA! Here's the problem. Any guy with a dozer is going to destroy a lot of things you will later wish you had some of. FIRST: catalog what you've got. Every tree and every bush. Crappy looking trees are often outstanding wildlife trees: hackberries, for instance, look like death warmed over for half their life, but they provide good food for dozens of species of birds, resident and migratory both. They're also soil builders, with their short life spans and quick-rotting dead limbs and so on. The "brush" that dozer operators like to take out along with "trash trees" (both terms in quotes because they don't belong) are understory shrubs that grow only close to nurse trees, and are also important for wildlife. There are valuable and now rare grasses that grow in partial shade (naturally, this late at night, I can't remember the names. But find out what you've got.) Catalog as much wildlife as you can, too. Do you have quail? Do you have wild turkey? Every kind of oak tree is good for turkeys and deer: they both eat acorns, including ones so bitter we'd hate them. If your land was ever in the tallgrass prairie areas, get a copy of Packard and Mutel (editors) THE TALLGRASS RESTORATION HANDBOOK, which covers the savannas and woodlands that coexisted with tallgrass prairie. If Oklahoma has something like a fish & game department focused on wildlife, get one of them out there to tell you what habitat supports what game. I definitely understand your concerns and I appreciate the pointers. I will definitely be doing research. I only consider them "trash trees" as most of them are dead or very poor condition in the field. Plus, they aren't the appropriate trees for being next to my habitat. As it stands, the dozer is only pulling out dead trees and small trees that have started to fill a clearing. He's scraping it back out to what it used to be. It's impossible for the dozer to not do some damage I dislike, but we are limiting it as much as possible. This is strictly for our houses. The rest of the land is being cared for by hand or tractor. Our houses are very close to the dirt roads (road is being generous) that already existed on the land. Most of the land will remain untouched. A good portion of it is in a 30 or 50 year flood zone. This precludes us doing any man-made habitats that we can't afford to be sitting under water. Those areas are absolutely beautiful, though, as they get a lot of water. A shaded picnic area might be nice. We do have mesquite growing in a field that are about 2 feet tall. We're pulling them out by hand to limit the number of flat tires we'll be enjoying in the future on the tractor. I had already planned on talking to the local game warden and getting pointers to resources for the local information. I know we get lots of dove and my father got within 30 yards of what he claims were 40 turkey. Deer and hogs are plentiful. Before we bought the land, it was being included in a hunting lease. We're getting the rest of the hunting land on our side of the creek on permanent lease ourselves. We have bobcats and rumor has it that black bears and mountain lions occasionally travel through. No orcs, so that's a plus. There is one thing I don't understand, though. Why is it that teenage boys feel a need to sneak up on armadillos and try to kick them? Have done it. There are videos on YouTube and also directions online. Great big animals (a ton of dead bull, for instance) you're going to lose part of the meat the first time because it's too big to manage quickly for novice butchers. Read up before you need to do it. Get the right tools. Learn the anatomy first. If possible, go visit someone while they're doing it, and help. If you've seen the critical points before (like how to get the guts and urinary tract out without contaminating the meat) it's a lot easier when you're faced with your first solo beast. The first stuff you cut up will look messy. Just eat it anyway. Stews, soups, and chili hide a lot of butchering inexperience. Remember to make stock from the bones. Thanks. My dad has done a little of everything. I don't think he has experience with cows, though. I'm guessing they'll be a ton more work than the deer he's done. We already own a meat grinder for the deer. You need something solid and sturdy to do a lot of meat. For our deer, we are building a walk-in fridge for 6 week hanging. I don't understand it all yes personally, but I'm told it is the proper way to handle the meat and processing immediately isn't as good. For the beef, we probably will. I understand that deer bones can be problematic due to several diseases which are primarily bone related. Still. I need to figure out a good use. I hate wasting things. With deer, you do need to worry about the cervid equivalent of BSE, yes. That, too, can be researched online, and you can also ask your state fish & wildlife service about its prevalence in your state. With beef, never consume a sick animal's meat--if it breaks a leg in a coyote den or something, fine, but not if it's staggering around. If it's healthy, then the leg bones below the big muscles make incredible stock. As for hanging beef for dry aging--nothing wrong with it, and it will tenderize it, but meat right off a youngish critter (the Hapless Heifer, in our case--she broke her leg in a coyote den) is incredible.